Municipality of Kresna in Bulgaria announces a competitive tender with reference number CB006.1.12.072-PP2-03 for Supply of 5 sets of water monitoring equipment under the project “Construction of systems for prevention and early warning of floods”, with the financial assistance from the INTERREG IPA CBC Programme Bulgaria-the former Yugoslav Republic of Macedonia CCI 2014TC16I5CB006-2015-1. 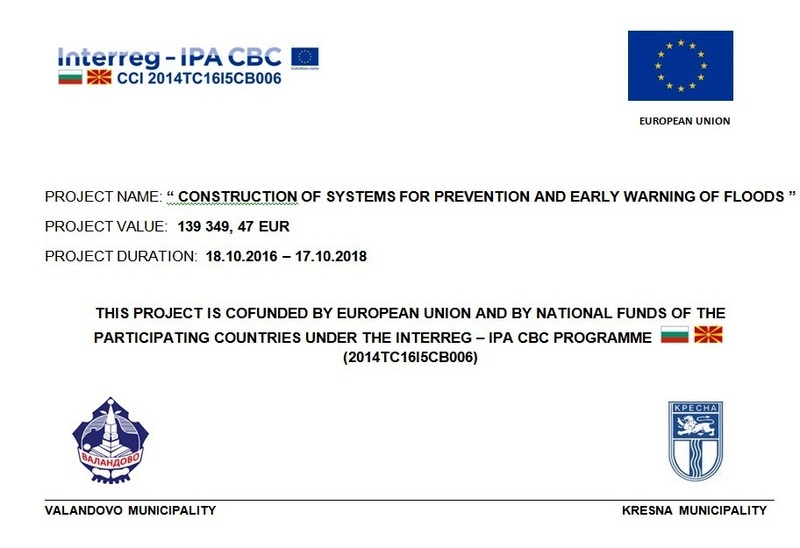 The tender dossier is available for downloading on Municipality of Kresna official website www.kresna-bg.com , as well as on the INTERREG IPA CBC programme official website http://www.ipa-cbc-007.eu , Section Public tenderers. Reason for cancellation: The tender procedure is cancelled on the basis of point 2.4.13 of PRAG - there have been substantial errors, irregularities in the procedure, in particular where these have prevented fair competition. Notes: А new contract notice will be published. Municipality of Kresna in Bulgaria announces a competitive tender with reference number CB006.1.12.072-PP2-04 for Supply of 5 sets of water monitoring equipment under the project “Construction of systems for prevention and early warning of floods”, with the financial assistance from the INTERREG IPA CBC Programme Bulgaria-the former Yugoslav Republic of Macedonia CCI 2014TC16I5CB006-2015-1.